Under globalization, the resolution of commercial disputes across national borders is assuming ever greater importance. This groundbreaking study explores a range of possible approaches, both within the established legal infrastructure, and through alternative, not only arbitration, but also non-confrontational means such as negotiation and mediation/conciliation. 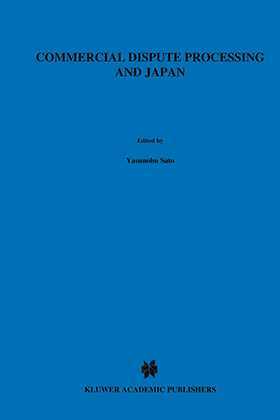 The Japanese experience in dispute processing is taken as a means of exploring the ways in which international harmonization efforts such as the UNCITRAL Model Law impact on individual nations. As an Asian nation which has adopted and adapted a variety of Western practices under modernization and democratization, Japan is in a unique position to offer a balanced global example--a model for a more comprehensive approach to disputes as an integrated multi-layered system. The book will be of interest to the scholar and practitioner of trans-national/cultural commercial dispute processing as well as those who are involved in the law reform technical cooperation.